Shingles are an excellent addition to any garden building. Not only do shingles make a stylish upgrade to the overall look of your shed or log cabin, they also provide unrivalled year-round protection from wind, rain and snow. Perfect for our unpredictable British weather! Shingles are more durable than standard rolls of felt and require less maintenance. If correctly installed and adequately maintained, your shingles can have a life of 25+ years! While installing shingles may seem difficult at first, do not fear. We’ve provided a step by step guide so you can install shingles with ease. Make sure that you are using a sturdy ladder and take care when working at height. 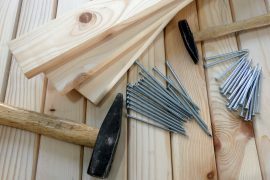 Install the first row of shingles so that the flat edge of the shingle strip can be folded over the edge of your roof board. Use clout nails at regular intervals to securely tack your shingles into place. 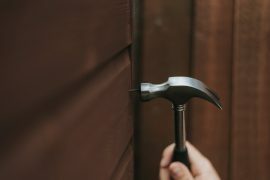 Make sure the nail is flush with the strip – not too deep into the shingles causing unneccesary pressure and risking tears. Also, try to hit the nails as straight as possible, so they do not enter the shingle strips at an angle. Repeat this process until the first layer of shingles has been installed on the bottom edge of your roof with no visible gaps. Place the second row of shingles in the opposite direction to the first row. These shingles should be positioned so the centre of strip completely covers the join between strips of the first layer of shingles, as seen in Image A. Repeat this process until you have completed the second row of shingles. Place the third row of shingles in the opposite direction to the second row. Repeat the process in Step 2 to conceal the join between the strips of the second layer of shingles. Continue with the next rows of shingles by alternating the direction of the layers and covering the joins of the previous layer. This alternating shingle placement helps to ensure that the shingles will be watertight, running directly off the roof instead of into any gaps. Once completing your roof, you should have numerous spare strips of shingles leftover. These can be used to cover the gap of the ridge line. Carefully tear or cut the strips into individual shingles (Image B) and fold them over the ridge. Allow a sufficient overlap so that water can’t enter any gaps between the ridge layer of shingles (Image C). Securely tack this last layer into place. Keep any spare shingles which can be used as replacements in the future. Now relax and take a well-earned break inside your newly shingled garden building! 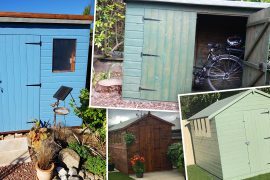 Tiger Sheds offer shingles in 4 colours, with a choice of slate black, red, green or brown. Our shingles are premium quality – typically used for houses – and feature an adhesive back for an extra-secure installation. 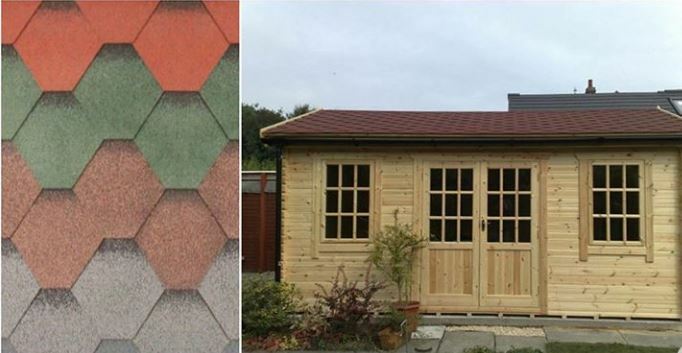 Shingles are available as an additional extra for our log cabins and summerhouses but you can enquire about shingles for your Tiger Shed by calling us at 0113 205 4189. Installation not for you? You can leave the hard work in the hands of our professional installation team, who will erect your garden building and fit your shingles as an additional upgrade! Add installation as an extra when purchasing your building, or give us a call if you’ve already ordered but would like to use our installation team. Previous articleDo I Need to Maintain my Garden Building?